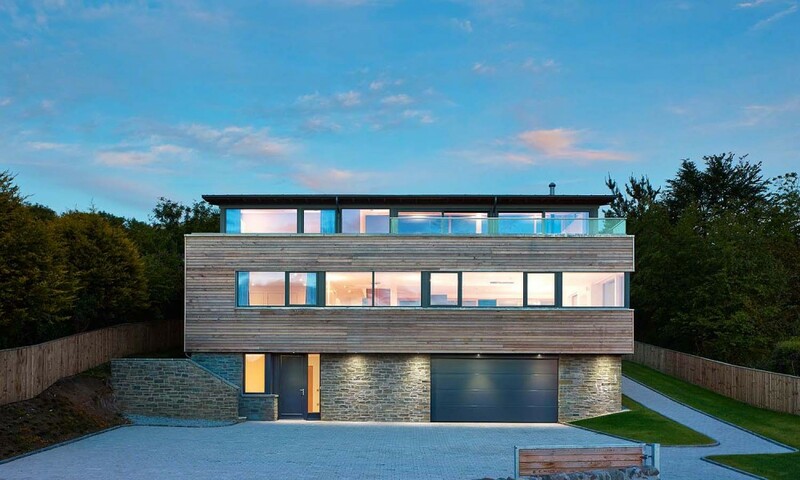 The house is sited in a natural rectangular hillside plot accessed off the main road into Kippford on the Solway Coast. 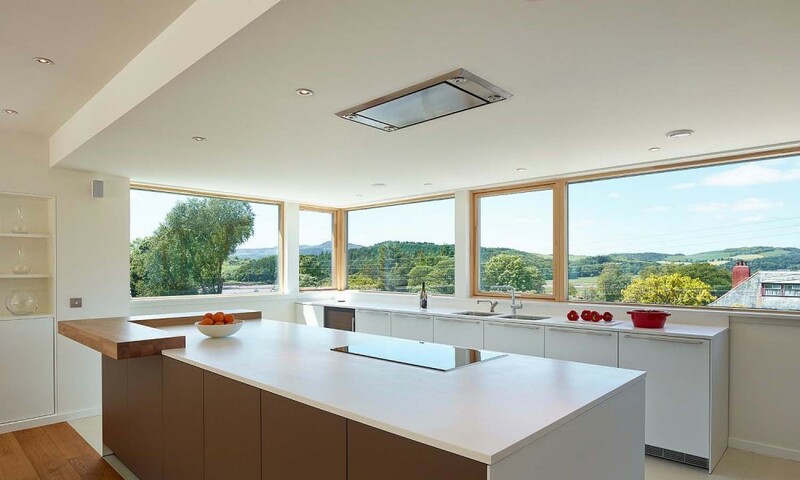 Principal views range between the south-east and north-west enjoying a spectacular landscape setting of the River Urr valley and hills beyond. 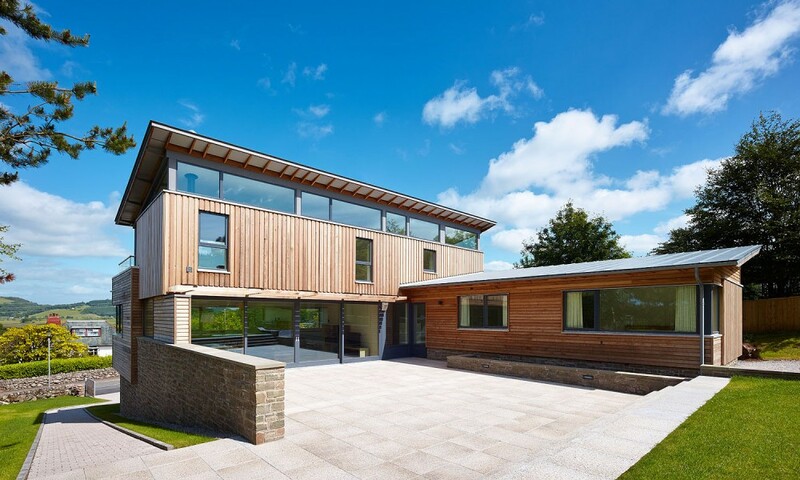 The intention was to create a contemporary house which responds to the slope of the site over three levels to capture scenic views, in doing so being sustainable in its construction and have very low energy consumption. 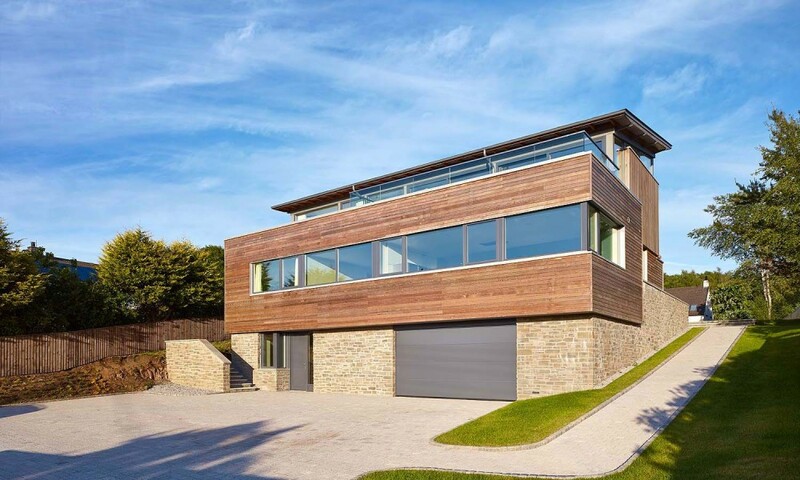 The design uses lightweight but highly insulated steel and timber frame construction, clad in cedar weatherboarding at upper levels, weathering to a natural silver grey colour to complement the hues of the lower level stone walls. The roof finish is pre-weathered grey standing seam zinc. 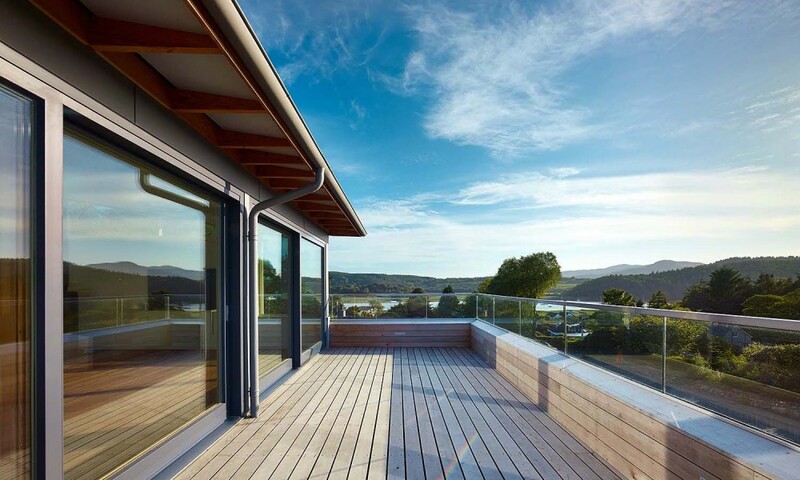 Windows and external doors are triple glazed high performance timber. The main entrance is sited at the lower ground to the north west. On entering a double height staircase leads to the main hall/living/dining/kitchen space proving panoramic views over the Urr to the west and access to the terrace/lawn to the south-east. 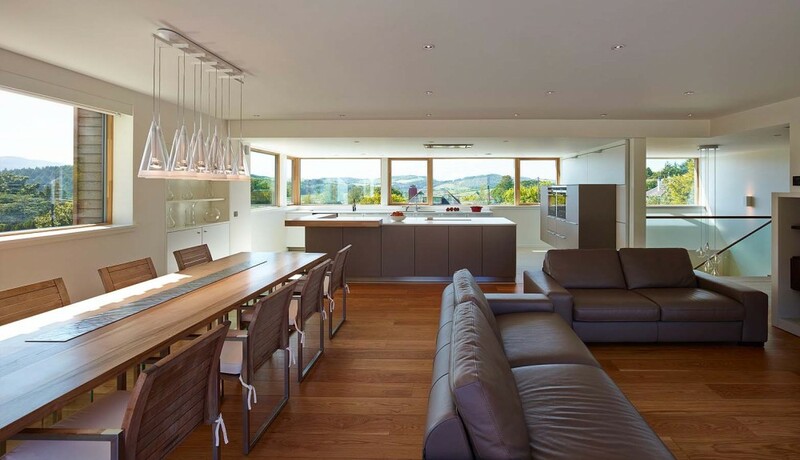 A double height staircase in the hall leads to the first floor lounge/terrace allowing elevated views to the hills. Bedrooms and ancillary spaces are along the north east edge over the three levels. 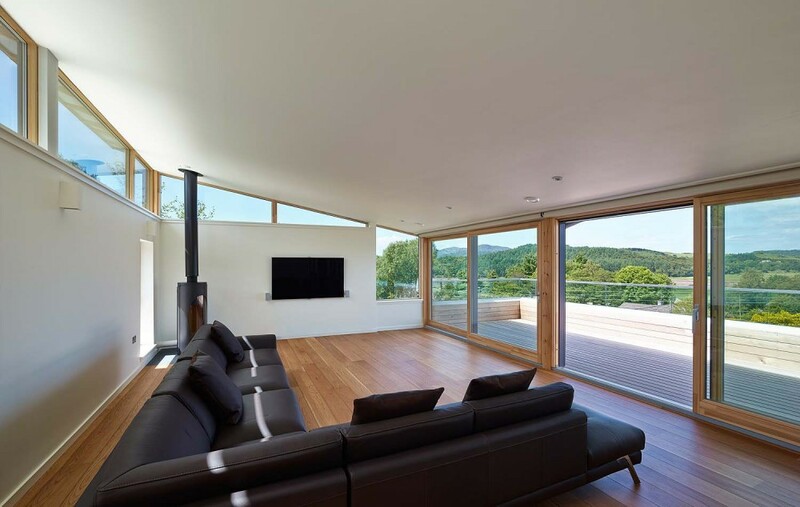 The house has Passiv Haus standards of insulation, minimises air infiltration heating, and uses an air source heat pump with a ‘whole house heat recovery ventilation system’ helping to reduce energy consumption.